Most pineal gland cysts are asymptomatic, meaning they do not cause any symptoms. They are occasionally found incidentally when a patient has a CT or MRI scan of the head for another reason. In those patients who have larger cysts, they can cause symptoms. Symptoms can include a condition known as hydrocephalus which is caused by the cyst compressing the cerebral aqueduct, a fluid-filled passage within the brain that is near the area of the pineal gland. By compressing the aqueduct, the normal flow of cerebrospinal fluid is blocked and pressure builds up which can lead to symptoms such as headache, nausea and vomiting, visual problems and even lethargy and coma if severe. A large cyst can also put pressure on the brain stem adjacent to it, which can lead to visual symptoms such as paralysis of upward gaze. 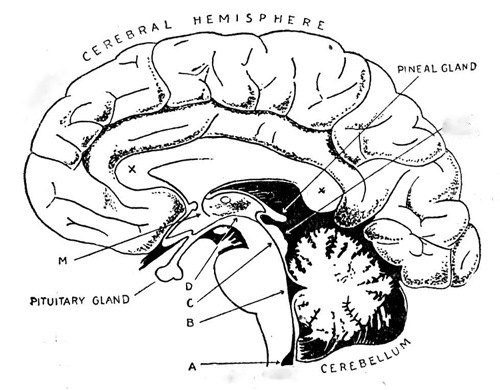 A pineal cyst is usually found on a CT scan or MRI scan. As mentioned above, often patients are asymptomatic and have a scan for another reason. If the patient is symptomatic, those symptoms may prompt a neurological evaluation and brain scan. Most pineal gland cysts have a characteristic appearance on an MRI and can sometimes be distinguished from other tumors of the pineal region, such as pineoblastoma, pineocytoma and pineal germinoma. In some patients it will be recommended to follow the cyst with MRI to determine if it is growing. In those which are enlarging or cannot be distinguished from other types of tumors, a biopsy or surgical removal may be indicated to make the diagnosis. Because most cysts are benign and asymptomatic, most patients with an MRI which is completely consistent with a benign cyst will be recommended to do nothing at first. The cyst may be followed with occasional MRI scans to determine if it is enlarging. In cases where there is any doubt as to the actual diagnosis and in patients who are symptomatic a surgical procedure may be recommended. A biopsy to obtain a small piece of tumor for pathology or a full surgical resection to remove as much of the mass as possible are options. In patients who a pineal cyst is confirmed, often no further treatment is necessary since these lesions do not tend to recur or grow significantly. However, every patient is different and cysts can be confused with other masses that can occur in the pineal region. Therefore, each case should be discussed with the patient's own personal treating physician. from the Pineal Cyst page.